Palladium, 1ct Si G/H diamond, diamond melee. A diamond butterfly engagement ring. 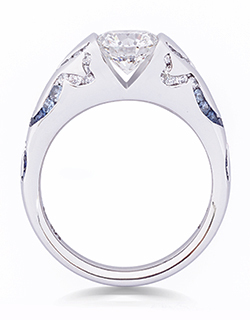 The 1ct center diamond is matched with five diamond butterflies on the shoulders of the ring. 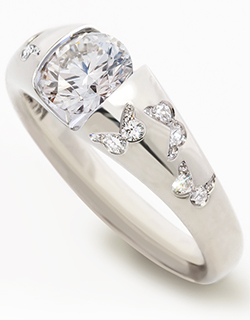 The center gem has an open setting to allow the most light to hit the stone, for maximum flash and sparkle. Available in any precious metal, set with precious gems of any colour. ― John Keats to Fanny Brawne, July 3, 1819. 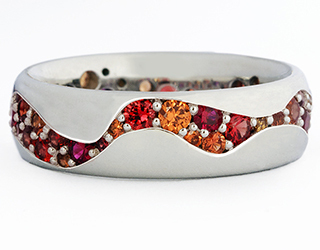 Palladium, Rubies, Orange Sapphires (beryllium treated). "...before she ever said "I love you" she hedged and said "I lava you," while holding up a picture she drew of a smiling volcano. Whenever I'm down, she pulls out that picture and bounces it around. I wanted to talk to you about making a ring for the girl I lava." Platinum, 1.29ct G/H Si1 diamond, melee diamonds, precision cut blue sapphires. Gideon asked Irina to marry him beneath a magnificent, rainbow-spanned waterfall in Iceland named Skogafoss. 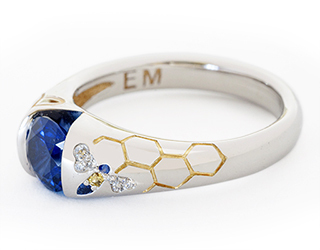 He was keen to represent this watery imagery in some way in his engagement ring for her. Cats are also of great significance in their lives and it was important to them that they were included somehow in the design. From the top, the ring I designed and made shows two flowing lines of diamonds and sapphires, set on each side of the center diamond. 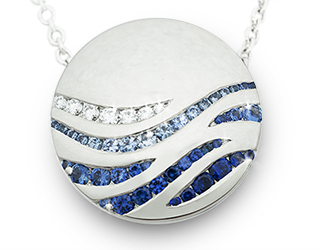 The gradation from white diamonds to light, medium and dark blue sapphires reminds them of Gideon's waterfall proposal. Only when viewed from the side is it obvious that those watery lines are the backs and tails of two cats. Platinum, Diamonds, Pink & blue sapphires. Todd and Hiroko had two marriage ceremonies - one in Hawaii and one in Japan. For their 20th wedding anniversary Todd commissioned a piece for Hiroko to reflect both celebrations. I designed a reversible pendant with blue sapphire and diamond waves on one side and pink cherry blossoms on the other.